Red Shoes on a Thursday | …and all that sort of thing. I am hanging my head in shame at the fact that I have not posted in almost two months. Where does the time go? Oh, I remember. It goes to elementary All-County rehearsals, and one high school for the pit of South Pacific, then another high school for the pit of Beauty and the Beast. Then some more time goes to a third, lengthier pit experience playing a community theater production of My Fair Lady. Oh, and let’s not leave out the extra after school practices for NYSSMA majors and the fact that I agreed to be in a show which goes up the last two weeks of school and requires me to tap dance. TAP DANCE. Not to mention it’s the beginning of wedding season and I’m playing more than my fair share of the Pachelbel Canon lately. So, what does one do when there is no time to breathe, let alone get a pedicure? Allow me to tell you. One turns to Sally Hansen Salon Effects, the best new freaking product ever. 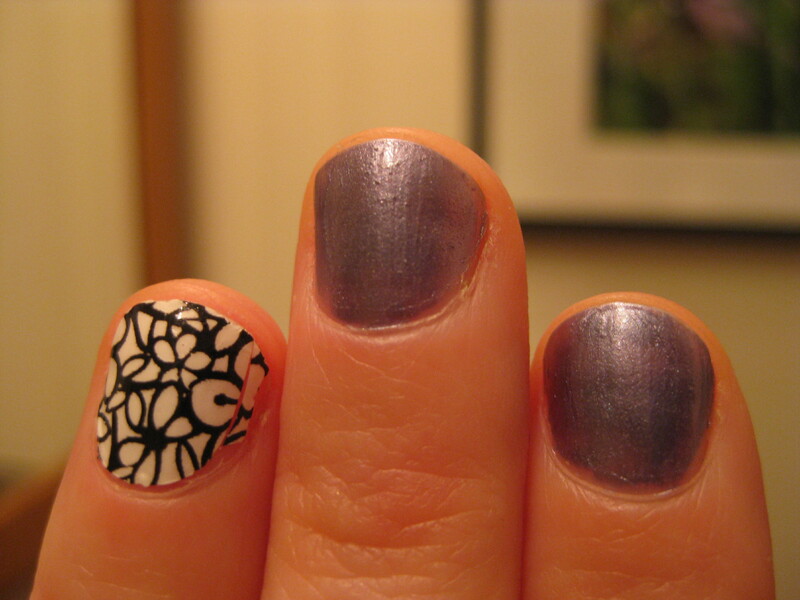 I should admit that I first saw these on the fingernails of a fifth grader. I was immediately intrigued. For those of you not down with the new fifth grade trends, Salon Effects are little nail polish strips- a nail polish sticker, if you will- which you peel off the backing, stick on your nail and file. They go on dry, so there’s no chance of smudging it once you put it on and it lasts for days. I tried it first on my fingernails in one of the more conservative solid colors, and I was really pleased with the results. I won’t say that it lasted any longer than a regular manicure, but it was certainly a lot quicker. At 9.99 they are a little pricey, but I got mine at Ulta when I had a coupon and they were on sale for buy 2, get 1 free. Please ignore my ragged cuticles and beat-up toes which have been stuffed into tap shoes a lot lately. I was so pleased- to me it looked like those plastic shrink wrap Easter egg sleeves… in a good way. 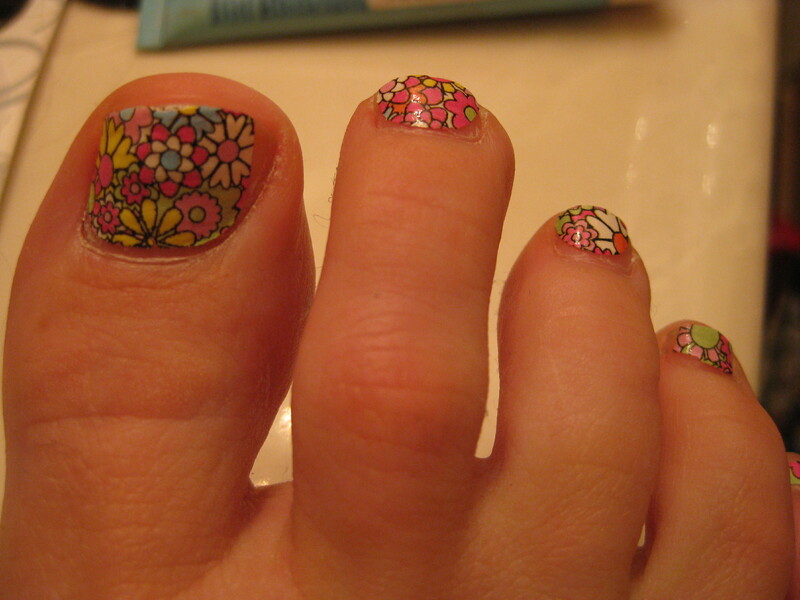 By the way, this photo was taken almost 3 weeks after I initially put them on my toes- not bad in my opinion! Today I decided to try a printed style on my fingernails, but I thought it might be a little bit much to do it on every nail. Instead I just painted all but my ring fingers and then did the strips on those. Also super cute! You can't really get the whole effect without seeing all of my fingers, but whatever. In the picture you can see where I had to cut and paste a little extra piece because I used a strip that was a little bit too small, but the beauty of the patterned ones is that you can’t even notice something like that unless you’re staring at it through a macro lens. Also, since I am-ahem- frugal, I stick down the strip, cut the remainder of it off and use the rest of the strip on another nail. Of course, Sally Hansen wants you to use one strip per nail, thereby spending more money on the product, but where’s the fun in that? They come off with nail polish remover, just like regular nail polish. Well, it’s been a little while since I last posted- I think the last time I checked in I was about to embark upon the weekend of performances for Guys and Dolls Jr. Despite all of our ridiculous hurdles, we managed to put out a nice dress rehearsal performance and I was relatively calm about putting on the show for the public. I had a leisurely Saturday, and went out in the afternoon to do a little shopping and some errands. I had left my phone at home and when I got home after 4:00, I noticed that I had two voice mail messages- both detailing how the male lead of our show had woken up that morning with a fever and vomiting. OMG. Luckily, the mom had some serious anti-vomit medicine handy and, after checking with a pediatrician, gave him the drugs that he needed to get through the day. The kid was a trouper, too- you wouldn’t even have known he was sick that morning. Of course, this was one of the few kids who I never had to worry about breaking character or missing lines… he was the least of my worries- until I had to worry that he might hurl on stage! Anyway, that aside, the weekend was a success- and while I was relieved for it to be over, I didn’t really get to relax last week, as I was gearing up for the NYSSMA festival I would be taking my students to the following weekend. For those of you not from New York, NYSSMA (New York State School Music Association) has festivals all over the state each spring for students to be adjudicated by a certified judge. My little ones just go for the experience- mostly they’re playing things like Lightly Row and Home on the Range… if there’s a real hot shot they might play a Bach minuet from Suzuki book 1. So, for me, it’s not really stressful- it’s just a weekend when I have to be impossibly perky and upbeat because I’m usually dealing with a kid’s first NYSSMA solo and I want them to have a good experience. This year at NYSSMA I only had two students freak out and cry. It’s funny- the ones who cry are always the total hams the rest of the time- so it’s always sort of shocking to see them break down over something like a NYSSMA solo. One of my 4th grade bass players was so nervous that he started playing his solo really fast in the warm-up room… and he couldn’t get through it. The tears were just rolling off the tip of his nose. His mom and I talked him off the ledge with the promise of cookies and potato chips afterward and he did fine. The other cryer was this normally sassy 4th grade violin player- she arrived a little late and I didn’t see her right away- but when I did, she had the tell-tale red, puffy eyes and did not look happy. I managed to calm her down with some effusive compliments and a couple lame knock-knock jokes. So, NYSSMA pretty much ate up my whole weekend and now this is my last quiet night before I jump headfirst into a high school pit orchestra I’ m playing for this weekend. Last night I made some pasta for dinner and I used that Philly Cooking Creme again- this time I bought the original flavor, and as I predicted, it was definitely the way to go. I sauteed some onion and garlic in a little olive oil, then added a cup of chicken stock. I had a whole bag of baby spinach that needed to get used, so that all went in. I also added a can of quartered artichokes. Then I stirred in the cooking cream and added some grated Romano cheese. I tossed it with some tagliatelli and had a nice dinner. It was also good a day later, as I ate leftovers tonight. I’m not going to bother posting pictures because it doesn’t look that much different from the last pasta I made. I think it was definitely a good idea to cut the cream with some chicken stock, though. It actually made it creamier and more saucy. I might go with the low sodium variety next time, as it was a little salty between the broth and the cheese. I’m not sure what to do about dinner the next three days- tomorrow I have a rehearsal from 5 to 9, Wednesday I’m getting my hair cut and colored and then going to a board meeting, and Thursday I have another rehearsal from 5 to 9. I could try to be good and pack some healthy food, but I know that fast food is going to lure me in. We’ll see. Which do you think it will be? Greek yogurt with granola and a banana or chicken McNuggets? Back from a brief hiatus. Whew, what a couple of weeks it has been. The last time I posted was around Eartha’s dental adventure, and she has recovered nicely. I would even venture to say that she has become a little more tolerable in general after her extractions. Maybe those teeth were really bothering her and that is why she was always so surly. Though, who am I kidding? She’s still Eartha. I decided to use the William Sonoma specialty pans Mom gave me for Christmas. I’ve used them a couple times since I got them and it was sort of a trial and error process. The first time I tried to use them, I followed the directions religiously and used the recipe that came with the pan, which called for lots of expensive ingredients like chocolate and whatnot. I don’t know what I did wrong… maybe I didn’t grease the pans well enough, and in retrospect I don’t think I had gotten my little oven thermometer yet so I wasn’t aware that my oven was not preheating as fast as I thought it was, and the cakes were probably a little underdone. Anyway, regardless of that, the recipe was definitely more of a brownie recipe than a cake recipe and it didn’t want to come out of the pans- so I was forced to turn the mess into cake balls. I had already made the buttercream frosting too, so I just mixed it all together and put it in the fridge to deal with later. There was definitely more frosting than I would have normally used for cake balls, and between the cakes and the frosting there was something ridiculous like four sticks of butter involved. 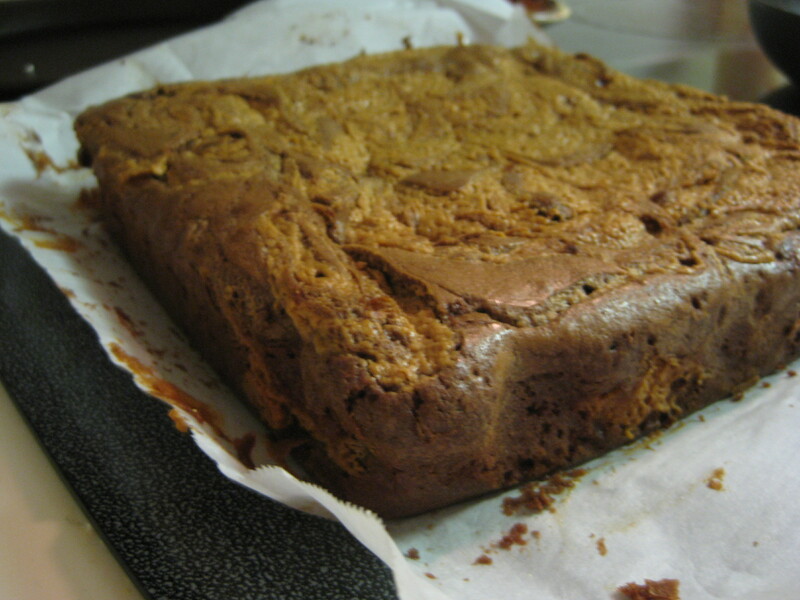 Well, when I took it out of the fridge the next morning to try and salvage it, it had cooled into a giant fudgy rock. I nearly gave myself blisters scooping out spoonfuls. It resulted in what I dubbed ‘Brownie truffle balls’. I didn’t think it was possible to make something richer than a cake ball, but there you have it. The second time I used my William Sonoma pans, I just used a cake mix. It was exactly the right amount of batter, and the cakes popped out of the pans perfectly. Go figure. 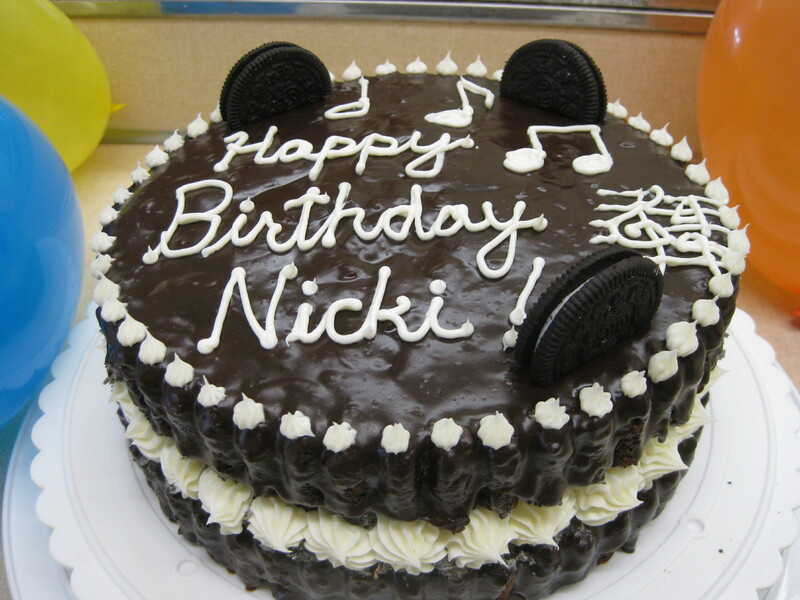 I just put vanilla frosting in the middle and decorated the top with some chocolate frosting and cocoa powder. This time when I used the pans, I decided to get a little creative. 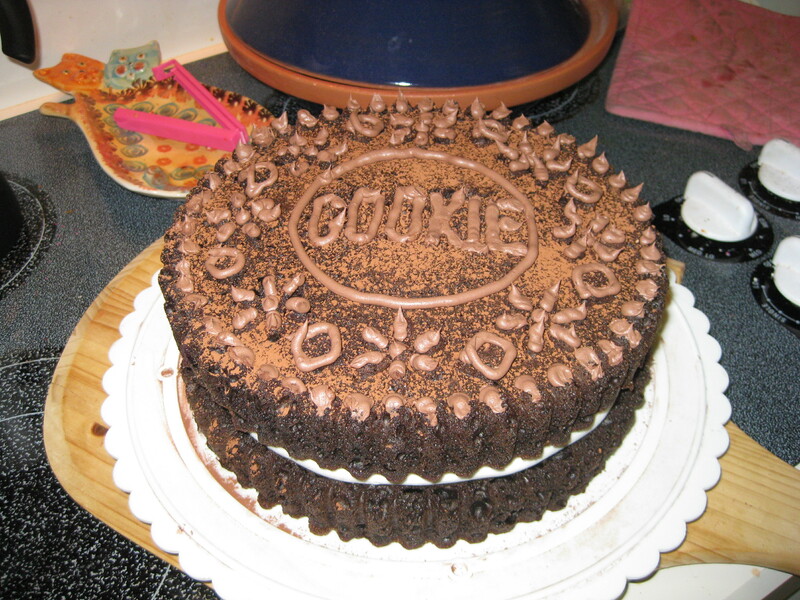 I still used a cake mix, but I covered each cake in chocolate ganache, and mixed the frosting with crushed Oreo cookies. 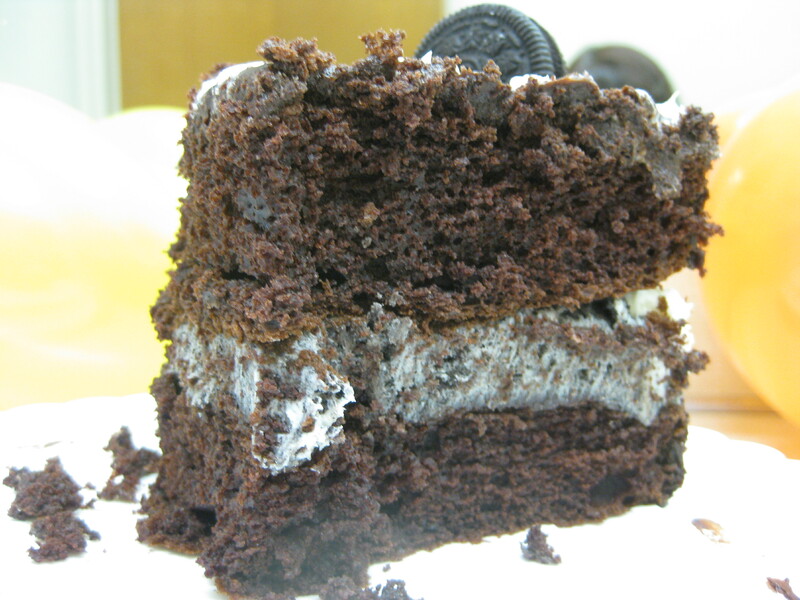 I probably could have used less Oreos, as it made the filling super thick, but no one seemed to mind. 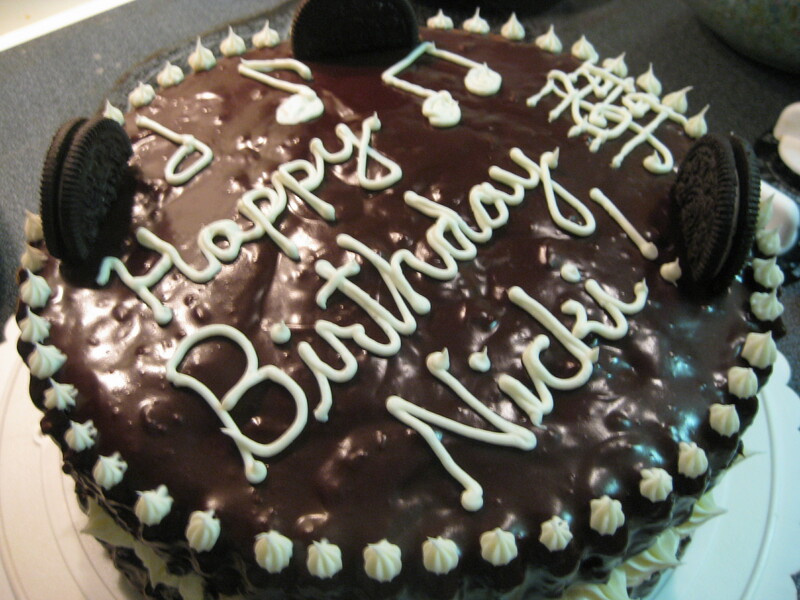 Then I just piped plain frosting around the edges to really make it look like an Oreo cookie and personalized the top. Okay, I feel better now that I have documented the cake. The reason why I haven’t posted in a while is because I have been smack in the middle of production week for the my school’s Drama Club production, which I have the overwhelming task of directing. Overwhelming, you say? But I thought you teach fourth and fifth graders? It must be so cute. Ha ha ha. Our spring musical has evolved into this behemoth with a cast of over ninety kids, and we rehearse for four months. So, it pretty much takes over my life, especially towards the end. Last year, we did Annie Junior– so I wanted to choose a show with more parts for boys, which led me to choose Guys and Dolls Junior. I will leave out all of the gory details, but let me say that I now have a few more grey hairs and all have names which commemorate certain cast members. At the beginning of the week I wasn’t sure how we were going to pull it all together, but as such things always do, we ended up with a nice school performance yesterday. Two more shows this weekend and I can get on with my life. Some of the more memorable moments onstage yesterday included a kid manifesting his stage fright in an urgent need to pee during the opening number- he ran offstage and I prayed to the theater gods that he would return in time for his next line moments later. He did. Another kid got stuck backstage behind a group of crapshooters and missed his entrance because he was too meek to push his way through. Not to worry, he made up for it later by coming out way too early for another entrance, stopping in his tracks and slowly backing up until he was offstage. My favorite moment though, was during the Havana scene, where I noticed an unopened pack of fruit snacks on the stage by Sarah and Sky’s feet. Apparently someone was hoarding fruit snacks in their suit pockets backstage and we kept finding mysterious fruit snack trails everywhere, a la Hansel and Gretel. All right. I have sat in front of the computer long enough. I have too much to get done today, and I would really like the day to include a trip to the gym. Would you believe I still haven’t gone? Eartha hates dentistry more than me. Today I had the pleasure of bringing Eartha back to the vet for her extractions. She had two teeth in bad shape and the vet suggested making the appointment right away, so being the dutiful cat mommy I set up the appointment. I knew I was going to be in trouble when I had to take away her food and water at 9 pm last night. Eartha gets in trouble on normal nights when she just wants fresh food… let alone being deprived for half of a day. I fed them yesterday evening and she was taking her time picking at the food, so when I took it away at 9, I don’t think she had eaten very much. I prepped myself for the impending wrath by closing the bathroom doors (the night before I awoke to a crash when she knocked the magazine rack off of the toilet tank) and the the bedroom doors. When I came downstairs this morning, she had knocked all of the books off of the coffee table, but luckily the glass candle holders were still intact. Okay. So I paid the almost 500 dollar bill and went to the back. Apparently, every time someone walked by Eartha’s cage she would screech ferociously at them and lunge forward while punching her paws through the cage in an attempt to make contact with her ‘enemies.’ They tried to quiet her down so she wouldn’t totally freak out all of the other animals by covering the front of her cage with a towel. Well, as soon as I came back and they removed the towel, I got screamed at. By the cat, that is. This was not one of those scenes where Eartha is ill-behaved and then I show up and she is all purrs and sweetness. No, she wanted to attack me just as much as she wanted to attack everyone else. The noises coming out of her were so ridiculous that the tech and I just stood there for a minute in disbelief, almost laughing. And there you have it. That is exactly what Eartha sounded like, except she was being way more violent by lunging at us and trying to beat her way through the cage. I find it amusing that an asthmatic cat with respiratory problems has the lung capacity to create such impressive noise. I noticed when I found the youtube video that there are a lot of comments on it from concerned people who think the cat must have been abused, but clearly they don’t have a cat like Eartha. When I got her home, I let her out of the carrier and she attempted to scurry away, but I guess she was still a little drugged and had trouble staying upright. Great. So now I had a drunk, angry, hungry cat. I put down some wet food for her and she attacked it like a competitive eater. She kept going back and forth between the wet food and dry food like she couldn’t decide what she wanted more. I’m amazed that she didn’t barf it up. Around dinner time I squirted the pain meds into her mouth and she has been pretty quiet ever since. Hopefully she will be back to her old self tomorrow. Oh, I also made a SLAMMIN’ birthday cake tonight for one of my friends at school tomorrow- but I’ll wait to post about it until tomorrow when I can take pictures of it in natural light. Until then, goodnight! 3. Tackle the French macaron. I have been intrigued by macarons for a while now- they’ve been a staple in French bakeries forever, and they’re starting to eke out the cupcake as the new trendy bite size dessert in metropolitan areas. Up until recently, the macaron was not something that home bakers even attempted, but thanks to new cookbooks shedding light on the process of macaron making (and lots of online tutorials), they are getting made more and more at home. By the way, they are still pronounced ‘macaroon’ but I think are generally spelled the French way to avoid any confusion with the coconut cookie that is a distinctly American creation. French macarons have nothing in them but sugar, almond flour and egg whites (oh, and a tiny bit of vanilla extract and food coloring.) 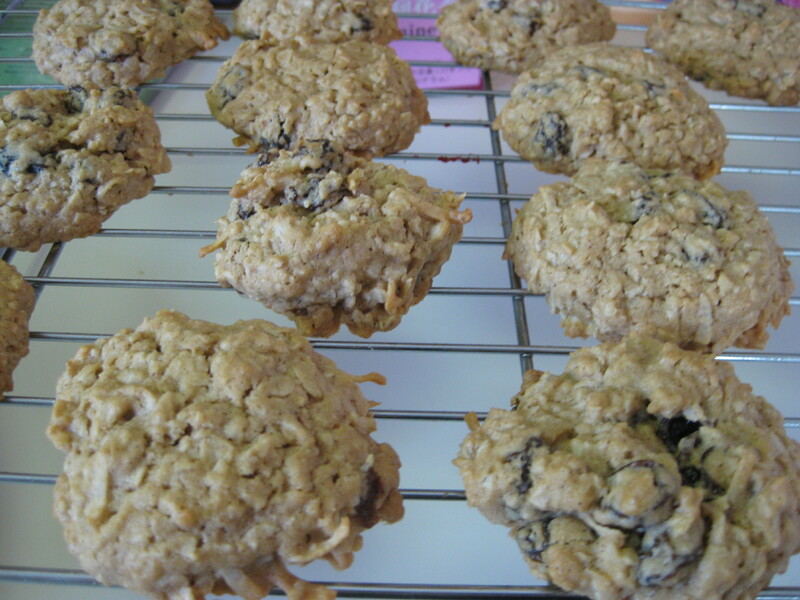 If you read a recipe for them, it’s an extraordinarily fussy little cookie. Because you’re essentially working with a meringue, you can’t even think about making them on a humid day. The egg whites are supposed to be separated and then aged for 24 hours at room temperature to get rid of some of the moisture. After the ingredients are folded together, you pipe little uniform blobs of the batter onto parchment paper and then have to let it rest for 15 minutes so it will develop the trademark smooth top and ‘foot’ on the bottom. 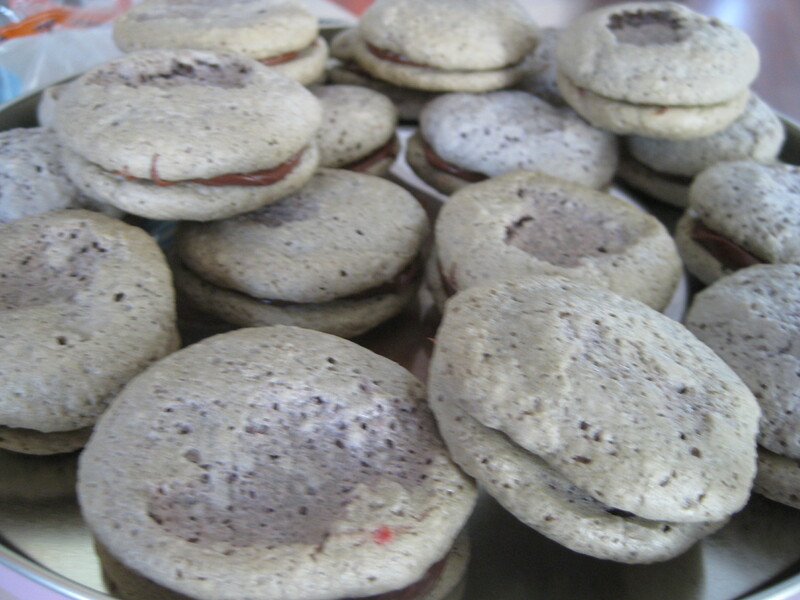 I received a little macaron cookbook for Christmas and have been toying with the idea of making them for a while. The recipe was for a lot of cookies, though- and I didn’t want to separate 8 eggs and have the whole thing be a waste if it didn’t turn out right. I researched online about using Eggbeaters Just Whites- which is made only of egg whites but is pasteurized, so I wasn’t sure how that would affect the recipe. In the end, I actually used a recipe in Martha Stewart’s Baking Handbook, only because it was for a smaller amount of cookies. Martha’s recipe didn’t mention anything about aging the egg whites or letting the cookies rest before baking. 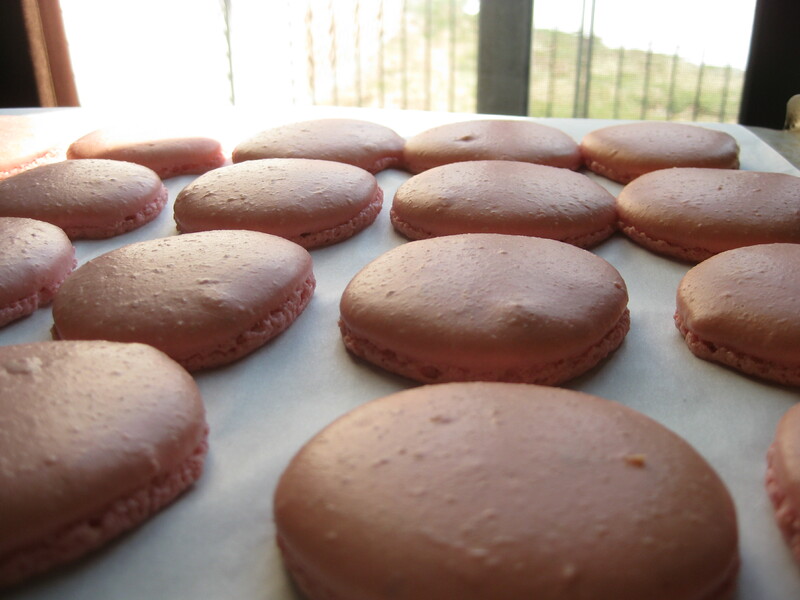 It also recommended baking for 20-22 minutes, whereas the macaron book suggested only 14. So, I didn’t bother with the egg aging. I just separated my eggs and got to work. 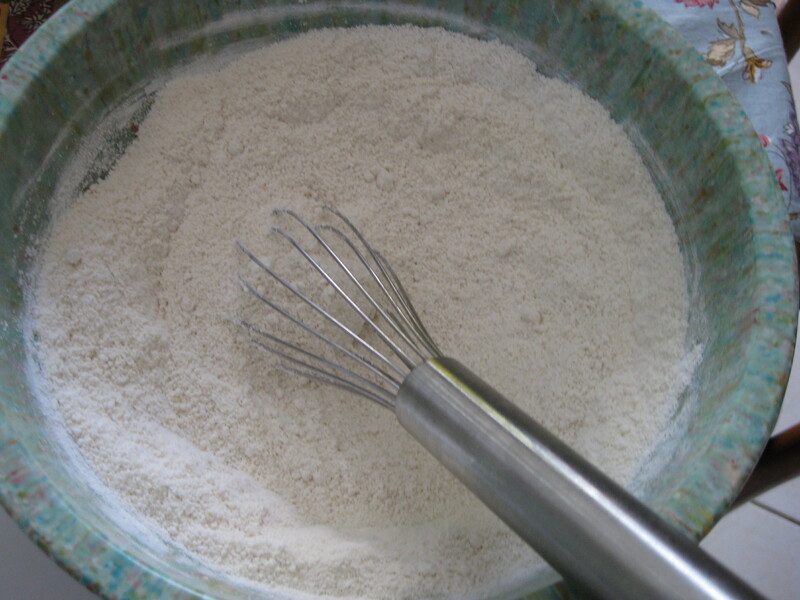 Confectioners sugar mixed with almond flour. Almond flour is 10 dollars for 16 ounces. Damn! Next I whipped up the egg whites, sugar and food coloring. 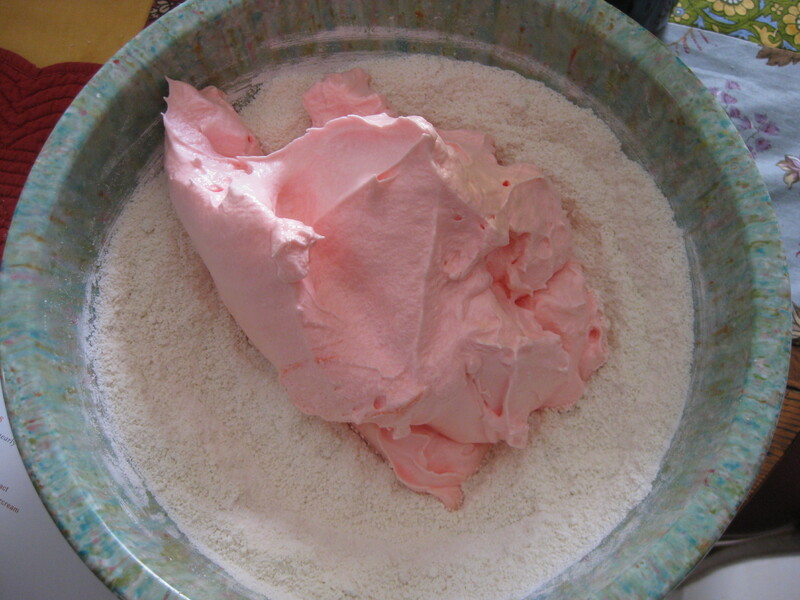 Fluffy pink meringue about to be folded into sugar/almond flour mixture. Notice that I didn’t say I put in the vanilla.That is an important detail later. I piped them out onto the parchment and started to let them rest. Then I realized that I forgot the vanilla, which was only 1/4 of a teaspoon and could have probably been left out. Regardless, I scraped the macarons off of the parchment, back into the bowl and stirred in the vanilla. Now the whole mixture had lost most of its volume and I was sure I would be left with failed macarons. But I pressed on. I re-piped them onto fresh parchment and put them in the oven. They didn’t seem to do much for a while (and I’m pretty sure I piped them too close together) but they were staying smooth! They were developing feet! It was a miracle! I am fairly certain that they were a little underdone, but they looked so pretty! I filled them with Nutella because I didn’t feel like making ganache. Fugly macarons. They still taste good, though. 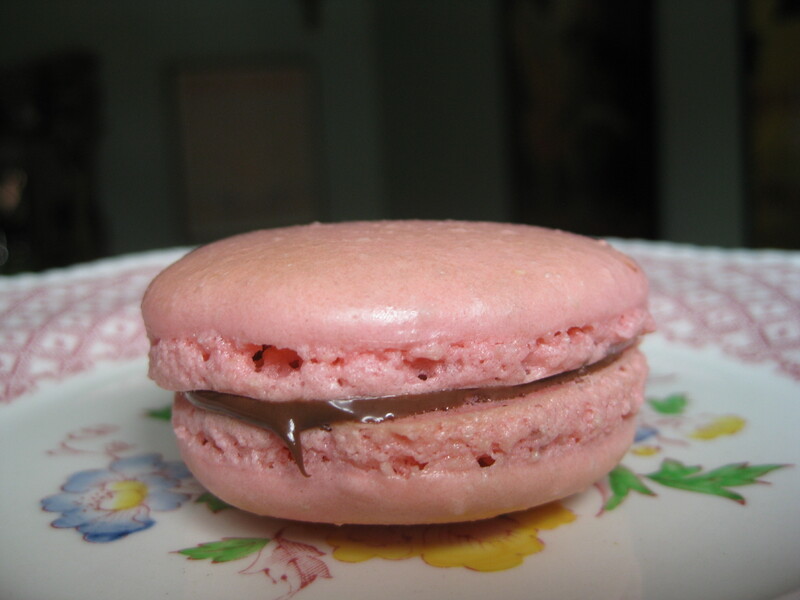 I think the verdict on the macarons is that I would definitely attempt to make them again, but fresh eggs are the way to go. Maybe I’ll even take the time to ‘age’ them properly next time. Last official day of vacation… sigh. It’s 10:30 in the morning and I’ve had my coffee and breakfast sandwich. I knit a few rows on the afghan and have been flipping between reality tv on Bravo and the third hour of Today with Hoda and Kathie Lee. It’s dreary and raining outside and I know it’s going to be a challenge forcing myself to shower and do anything today. I really have to get to that darn gym. Normally today would be the type of day for making a big old pot of soup, but I actually have the stuff to make lasagna, which I bought yesterday before I knew the girls wouldn’t make it for dinner. Coincidentally, they arrived after dinner time, but neither had eaten- so it was a good thing I had those tasty ravioli leftovers. The brownies also turned out well. 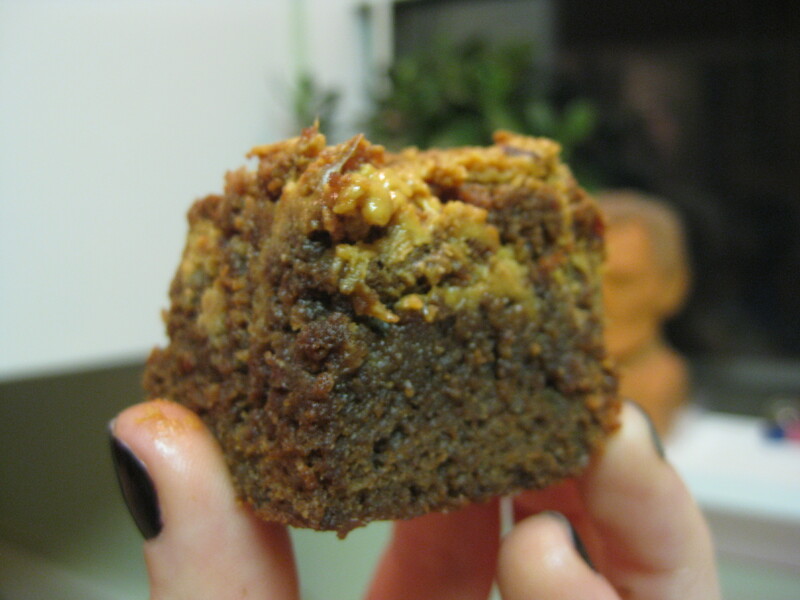 They were a little cakier than I hoped, and I think they needed a little more chocolate flavor (the recipe only called for 6 ounces of chocolate) but the peanut butter made up for it. Maybe next time I’ll add some chocolate chips to the batter to make them a little more chocolaty. I bought the ‘no boil’ noodles for the lasagna, so we’ll see how that turns out. I should probably get started on that now so I don’t have to do it later. I need to accomplish something or this is going to turn into one of those ‘lost’ days, when you blink and suddenly it’s 6:00 and you’re still in your pajamas. It’s days like today that make me kind of wish I had a fireplace. I do have a fake one on the Wii… but somehow it doesn’t quite cut it. Alright. Time to get my lasagna on. My week of February break is quickly drawing to a close, and when I think about what I’m going back to next week it gives me a little bit of the agita. It’s basically full speed ahead until the end of the year… which I guess is a good thing, because it will be July before I know it and I’ll be neglecting the blog again in favor of sitting by the pool. Today really felt like a vacation day, because everything I did was fun. I started out by meeting friends for what was initially supposed to be brunch (though I don’t know where we were going to find brunch on a Thursday other than a diner, and even then it wouldn’t involve mimosas and bloody marys) and ended up being lunch at a local Mexican place. I went with some of my friends from work and it is always so nice to get a chance to hang out with them totally outside of school. Everyone is so much more relaxed. So anyway, we had a very nice time. I didn’t have to be home right away, so my friend D—– was going to get a manicure afterwards and invited me to come along. That sounded like a good idea to me, as the last time I had a manicure was some time back in October. We actually ran into another friend at the nail place who had the same idea. So at this point of the day: Lunch, check. Pretty nails, check. The only other thing I really needed to do (besides finally show my face at my new gym… which I still haven’t done. Tomorrow, I promise!) was to deposit a couple of checks at the credit union. D—– had to go too, so we drove over together. Now, next door to the credit union is this Chinese massage place (no jokes, please) that D—– had been to once before on the recommendation of another colleague. Apparently, other than the pressure point/chi-related massage, they are also the place to go for sport massage. I wasn’t initially going to go in, but my neck and upper back have been bothering me for the past couple days and I’m in between chiropractor appointments, so I decided to go in. I opted for the 30 minute massage since I just wanted him to focus on my back. Now, I’ve had traditional Swedish massages before and I always was under the impression that I could handle a lot of pressure. Ha. In walks this tiny little man, and at first he is barely touching my back. So I’m thinking, “Oh, great. This is totally a waste of money.” Suddenly he started yanking on my limbs and twisting them around. Then he proceeded to go to work on my neck so intensely that my eyes were starting to water. It was definitely not a relaxing experience. Luckily the ‘extreme torture’ portion of the massage didn’t last too long, and the rest of it was pretty tolerable. He did, of course, notice that my left side was much worse and so I mentioned that I play the violin. He kind of chuckled and went, “Ahhhh…” and I think that’s when he decided I needed the extra painful massage. I have to say, though… my neck and back do both feel better, so maybe there is something to his methods. D—– didn’t seem to have any problems with her masseuse. She had a nice, relaxing experience. 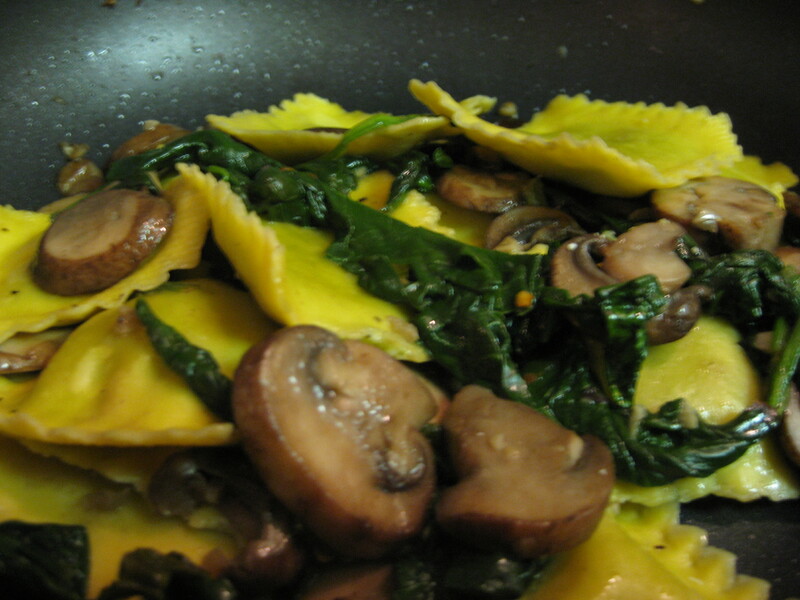 For my dinner, I had a package of fresh ravioli from Trader Joe’s made with Parmigiano and arugula. I had leftover mushrooms and fresh spinach, so I sauteed those with a little bit of garlic and olive oil, salt, pepper and red pepper flake. Oh, I also used a little white wine. At the very end I threw in some fresh basil and chopped fresh mozzarella. I tossed in the ravioli and sprinkled with a little bit of Romano cheese. It was super yummy, and I’m glad to have leftovers. When the girls get here I’ll cut up the brownies. I also have some of my favorite cheap champagne chilling and some fresh strawberries left over from fondue night.